I've been living most of my years with my long straingt black hair and have always wondered how I'd look like with a really short cut. I can still recall the first and last time I've had a level-to-my-ear hairstyle. At age four, I've tried that. Whenever I stare at those childhood photos of mine, my comments have always been, "Cute!" and then I give myself a deep sigh. How I wish I could stay cute forever. 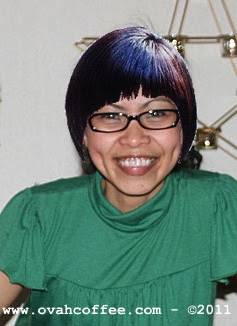 Anyhoo, Googling around, I've come across several virtual hairstyle websites. Eager to see myself with my childhood cut one more time, I've uploaded a close-up pic taken from summer of 2010 and searched through the many styles available. Finally, I've found what I've been looking for. I've saved the photo on my lappy and there it goes... the photo to your left it is! Oh. I don't know. These do doesn't fit a 32-year-old me anymore. They're right. There are things in life that are only intended for kids! Gotta go now friends! Need to do some shopping! Tag you here Blogger Award. Ui! Thank you so much Liezl for the tag! Will check it out in awhile. Hugs! Take care Cacai! See you around! I say, you stay with your pretty hair, Mon although I bet you'll surely stay pretty with this short do.